One of boxing's most heavily used descriptors is "he comes from a fighting family." Boxing can indeed be handed down as a family tradition, the way a sweater, a wedding band or any other vocation or hobby might. But the reality is that in the grand scheme of things, very few fighters are born directly into the fight game, so to speak. That is, duos of father and son who both chose the world's most dangerous sport as their professional livelihood make up a very minute percentage of boxing's overall populous. Another one of boxing's clichés is that it's a “sport for the poor.” It's also true that compared to the number of men who have stepped through the ropes, we have seen very few happy post-career outcomes. This is particularly true for black fighters, who until roughly the end of the 1960s were systematically oppressed and set up to lose financially. 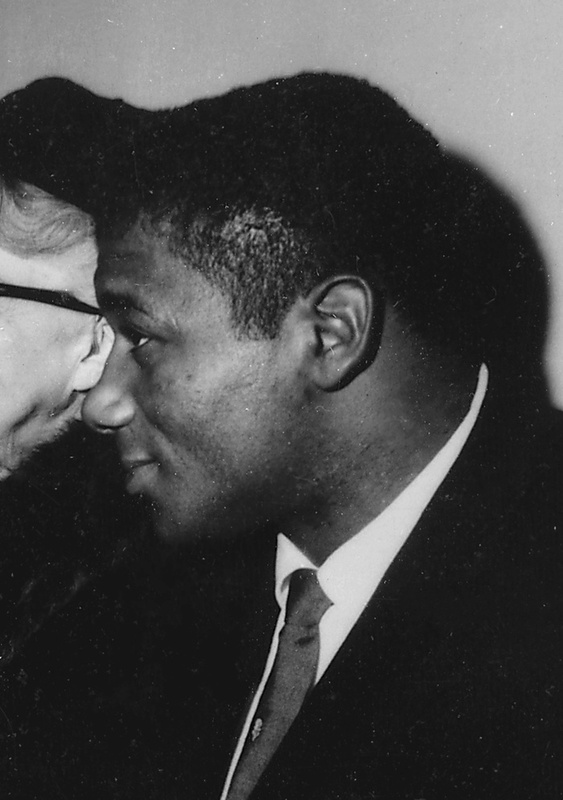 The men who were able to walk away from the sport with their finances in tact were often guys like Big Bill Tate or George Nicholson, chief sparring partners for Jack Dempsey and Joe Louis respectively. Tate and Nicholson collected regular paychecks, and because they mostly saw themselves as employees of the heavyweight champion first, more or less removed themselves from the toxic environment designed for them to falter. So when fighters retire poor with children who are by extension poor, the lack of funds and mounting medical problems aren't exactly alluring for their sons to chase after themselves. On the flip side, if they do turn out to be financially secure, their children no longer are among the poor the sport is designed for. Sometimes they'll dabble in it, but then decide that doing anything other than getting punched in the face for a living is an easier way to supplement their already hefty college funds. George Foreman III, for example, notched 15 professional wins, but never amounted to anything more than a hobbyist of a pro, beating a gaggle of fighters with a collective record of 107 wins and 220 losses before deciding that running a successful chain of gyms was a much better use of his time. That's not to say there haven't been some very good—and even great—fighting father-son duos in history however. Sometimes, men want to follow in their father's footsteps at all costs. Often times, the father is significantly better than the son, or vice-versa. Joe Frazier is one of the greatest heavyweights of all-time, and his son Marvis was a better-than-remembered fighter until he ran into Larry Holmes and Mike Tyson. On the flip side, Floyd Mayweather Jr. is the best fighter of his generation, but his father was a talented and stylish fighter lost in a very deep welterweight generation. This week is a significant one in the history of patrilineal fighting duos. Hasim Rahman Jr. makes his professional debut in his hometown of Baltimore on ShoBox. Were all the stars to align, Hasim Sr. and Jr. could one day go down in history as the only father and son to both become heavyweight champion. In doing so, Rahman Jr. chases an illustrious group of just five father-son combos to win world titles. The very first father and son to win world titles did so hand in hand. After an illustrious career as the two-time heavyweight champion of the world, and at one point the youngest ever, Floyd taught his adopted son the same peek-a-boo style and guided him to a world title of his own. As legendary scribe George Kimball once said of Patterson, he was “the owner of the uneasiest head to wear a crown this side of Henry IV.” Floyd was successful despite his insecurity about himself and compassion towards others—two things that generally don't mix potently inside a boxing ring. After his fighting career was over, Patterson claimed he just wanted to garden. But he couldn't escape the sport, and instead set out to help save young boys who like himself had grown up less fortunate by opening his own gym. One of the attendees was Tracy Harris, and in 1979, he and his wife Janet would adopt him legally. 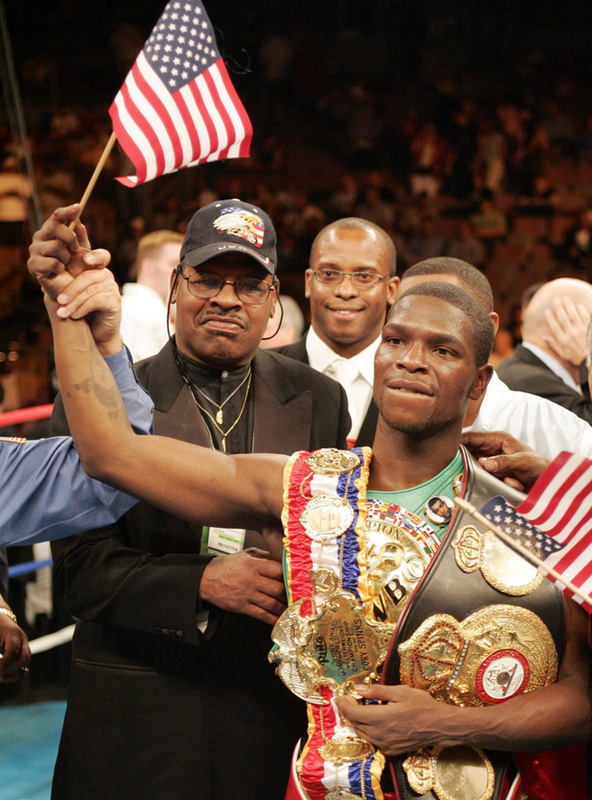 Tracy Harris became Tracy Harris Patterson, hard-hitting super bantamweight. In 1992, he would stop Thierry Jacob for the WBC's version of the 122-pound title, making he and his father the world world title tandem. It wouldn't be long before the two were estranged, as Tracy began disagreeing with both his father's business decisions, and his patented style. He started adding his own flavor to the Cus D'Amato seek and destroy gameplan, and would win a second world title at super featherweight in 1995. Though they lived just 20 miles apart, the two barely spoke for almost four years. Finally, prior to his 1998 fight against German Castro, Tracy got in his car and drove those 20 miles to his father and tearfully embraced him. Floyd simply asked, “what took you so long to come up here?” Tracy lost that fight, but he had his father back forever. Guty Espadas Sr. and Guty Espadas Jr. If we're talking about biological fathers and sons, then the Espadas family can lay claim to being the very first father-son duo to win world titles. Guty Sr. was a murderous punching flyweight, who won the WBA's version of the world title in 1976, and went on to defend it four times, winning each of those defenses by knockout. Guty Jr. would make history in 2000 when he won the vacant WBC featherweight title over Luisito Espinoza, before losing it two fights later to all-time great Erik Morales, who himself has fatherly boxing ties. The least respected, but the most accomplished of the five pairs on the list, Leon and his son Cory are the only father-son combo to have both won lineal titles. Leon and Corey's relationship is one of both triumph and tragedy. In 1978, Leon upset Muhammad Ali to become the heavyweight champion of the world, and one of the most recognizable sporting figures on the planet. Five days later, Cory was born, but by then his father was no longer with his mother. All within six weeks of the biggest victory of his career, Leon fathered a son he didn't live with, was sued by a former landlord and a hotel, and was arrested for driving the wrong way down a one-way street without a license. The two had a distant relationship, but even that, and the tragic passing of his brother and best friend, wouldn't keep Cory from following in his father's footsteps. In 1999, his biological mother tragically passed as well, and the grief brought father and son closer than ever. Four years later, Cory would win the lineal welterweight champion with his upset over Ricardo Mayorga. Almost a decade after that, Leon and his Hall of Fame brother Michael, Cory's uncle, would be cornering their kin during a world title fight in St. Louis. Wilfredo Vazquez Sr. and Wilfredo Vazquez Jr.
Wilfredo Vazquez Sr. Is vastly underrated in the opinion of many fight historians, having won world titles in three weight classes and fought no less than 14 world champions or Hall of Famers in his career. It was a career that also started because of his father. Two months after his father passed, Vazquez Sr. took up boxing at the age of 18. 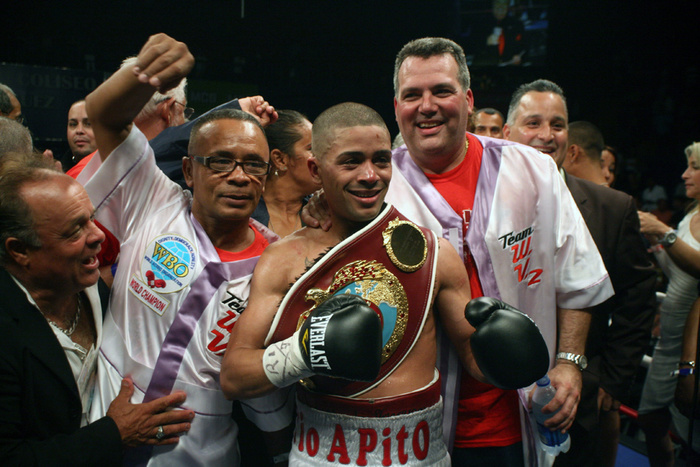 He claimed he wanted to win a world title like his father's hero Wilfredo Gomez, and he did exactly that. 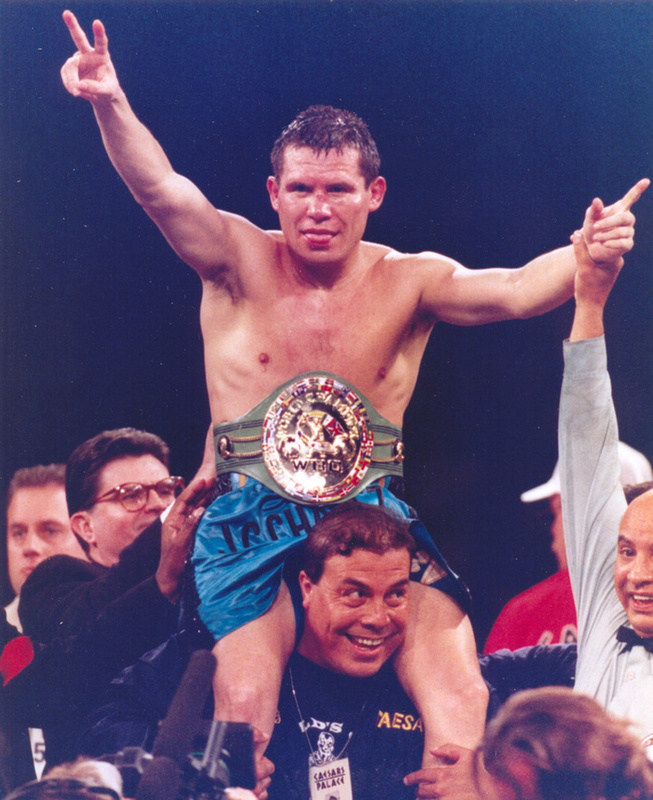 Julio Cesar Chavez Sr. and Julio Cesar Chavez Jr. The most recent addition to the list is also probably the wealthiest. Aside from the Mayweathers, it's likely that no father-son duo has made more money than Julio Cesar Chavez Sr. and Jr. The elder Chavez is one of the greatest fighters of all-time, arguably the greatest Mexican fighter and almost unquestionably its most popular. His son has inherited plenty of that popularity, perhaps on name value alone, but within the boxing community he is overwhelmingly disliked. Chavez Jr. did hold a version of the middleweight title, but the perception has always been that were he not the son of a legend, that never would have happened. His behavior has been indicative of a lack of self-awareness at times—repeatedly missing weight, flaking on training sessions even while being filmed by HBO's 24/7 crew, bouncing from trainer to trainer seemingly on an annual basis. But even while Chavez Jr. was groggily eating cereal in pink briefs while his father was trying to talk strategy with him, Dad has never been anything other than his most vocal supporter, ensuring that however negative public sentiment gets, Mexican fans still have to cheer for Chavez Jr. because of El Grand Campeon. At Just 7-1, is Vasyl Lomachenko the World's Best Boxer?